Hibs have been drawn to play Arbroath at home in the fifth round of the Scottish Cup. 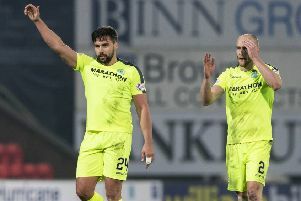 The Championship side, who ensured their place in this afternoon’s draw by defeating Alloa 2-1 on Saturday, will entertain the League 2 leaders at Easter Road. Fellow Edinburgh club Spartans will face Berwick Rangers or Albion Rovers at Ainslie Park. Both sides play in League 2 and give Dougie Samuel’s Lowland League outfit a realistic chance of progressing to the quarter-finals. The ties will be played on the weekend of February 7. Full draw: Rangers v Raith Rovers; Queen of the South v St Johnstone; Dundee v Celtic; Hibs v Arbroath; Falkirk v Annan Athletic or Brechin City; Stranraer or Dunfermline Athletic v Dundee United; Partick Thistle v St Mirren or Inverness Caledonian Thistle; Spartans v Berwick Rangers or Albion Rovers.